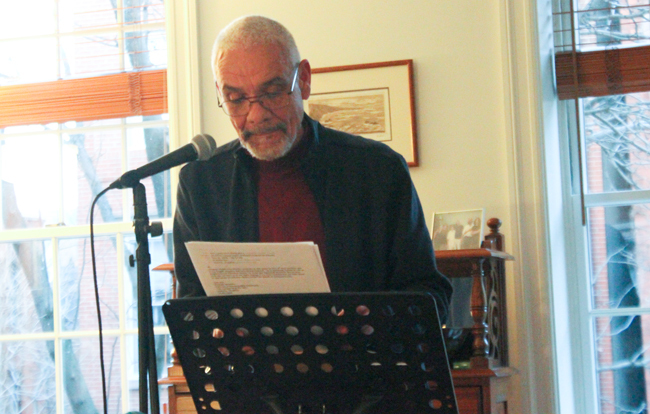 For his 75th birthday party on Saturday night (a day before his birthday), William J. Harris organized a poetry reading. He read, along with Cornelius Eady and Tracie Morris. Harris read several poems including pieces about race in South Africa and in the U.S. In the poem about the U..S, he talked about the implications of being a light skin black man. He has been (mis)identified as Mexican, as Italian, and as Arab. He read a poem about his cat. In the poem, the cat expresses its distaste for free jazz--a mode of music that Harris himself really enjoys. Most of the poems he read were short. However, he read a longer piece dedicated to his friend, the late poet Kenneth Irby. It was a poem, but as Harris noted before reading, the piece on Irby included what might be viewed as prose poetry. Some of the sections, that is to say, read like prose, as Harris recounted being in the hospital with friends and Irby during the poets last days and hours. Harris had noted that many poets these days drop prose into their poems. That's a good point. Most notably perhaps, Claudine Rankine's award-winning and widely read book Citizen: An American Lyric is an extended prose poem or a series of prose poems. While listening to poets read, especially poets who are storytelling- or essayist-poets, aren't we regularly encountering prose? For that matter, how often during readings are we unaware of line breaks? Harris was being typical Harris by noting what he's witnessing other poets doing. It's rare to hear that kind of comment during a reading, as poets -- too often I think -- tune out what's being done by various other poets. But Harris is always sharing what he's been reading and listening to and noticing among artists. The Irby poem was somber. Harris decided that he wanted to end on a lighter note, so he closed by reading his poem "Modern Romance" about a robot that disrupts a marriage. The poem contains three sections: first, we hear the perspective of a wife who is jealous of the robot, then the perspective of a husband, who likely murdered his wife to start a relationship with the robot, and finally the perspective of the robot. It's an amusing poem, one I wrote about some years back. Harris's poems are much shorter than poems by poets I've encountered at many readings I've attended over the years. He'll present a humorous or even philosophical insight from an everyday occurrence. Accordingly, his reading style is conversational. You could imagine hearing the content of his poems as you're walking with a friend down the street. Or over dinner. Or at a birthday party right before or after a poetry reading. Given the many dramatic reading styles I've witnessed, Harris's conversational approach really stands out as distinctive to me. He's not entirely alone, as I've sensed those kinds of poems somewhere else perhaps, but not much.